We know flight tickets gets pricier as the date of travel approaches. We planned to go to India, our home country, in the month of December. I initially planned to buy the tickets as early as July/August, checked the price and they were, in fact, the cheap. But, I did procrastinate. I didn’t buy the tickets till November and as expected, I had to buy those two tickets at a higher price. We do procrastinate all the time. Be it the time to get a shower, time to wake up in the morning or to pay the bill before the ‘due date’. Delaying on things cost dearly. In the financial domain, prices soar, demands change, stocks go higher or lower. Time decides how much money you can make from stocks. Time determines if you need to pay late pay penalty on your credit card bill. People are aware of the undeniable ways that procrastination can impact their life. While it is true that money is not the only thing that really matters in a person’s life, still, we prefer a secure and stable financial life. Sadly, procrastinating is a difficult habit to break. In point of fact, some people delight in an elated rush of a last-minute push to complete a certain task. In the same way, there are people who are enthralled in what is known as analysis paralysis which conveys that they over think of a certain thing and do not get around taking the proper action. In actuality, regardless of the rationale why people drag their heels, it is definitely high time to be wise about the financial impacts of procrastination to reveal in real dollars how it actually brings about a chaotic situation on your wallet. You don’t plan well enough. When a person does not plan long enough, it only means to say that they are not fully aware of immediate and long-term consequences of his or her present financial decisions. In reality, it is a must for us to contemplate on the fact that financial planning is not only about having a better future but it is also about having a better “present”. Putting off the opening of a retirement account. Perhaps some people do not like filling out documents. Some feel overwhelmed by their options or some delay this process until they are in a better position financially. More than that, whatever your excuse is, take into consideration that every day that you are not able to open a retirement account will only lead to having more financial troubles in the future. Skipping your regular medical or dental checkups and delaying the practice of a healthier lifestyle can cost you more. And, it may even be worse if you end up having a terminal stage of a certain disease due to procrastination. So instead of being treated earlier and paying lesser medical bills, you end up critically ill and spending more on hospitalization, medications and other treatments. Delaying the payment of your bills can cost you more money since you will be charged for penalties for delayed payments. This is a clear example when your bills have bills. So, avoid late payment fees by paying your bills on time. Procrastination can affect career. Essentially, the manner a person works directly affects his or her results, how well he or she did the job and how much he or she achieves. Procrastination inhibits a person from achieving his or her targets and meeting deadlines; what result will this have on their career? They may miss out on opportunities like promotions or may be at risk of losing his or her a job. You keep putting off your home and car fixes. And when you can no longer put off, it cost way more than the cost it would have incurred when the problem was small enough. You sit on it and make the bad become worse and then terrible, by the time you take it up. Procrastination can result in a significant stock market loss. Stock market is all about timing. Making money out of stocks, especially those who trade frequently, depends largely on timing. Your extent of profit and loss depends on the time you buy a stock and the time you sell that. Procrastinating on a buy or sell order might change your fortune altogether. Sometimes procrastination can lead to more profit in a share market due to procrastination you can get a real estate at a much cheaper price or you can sell it at a higher price. Be reminded that when you do not plan your financial life, you are at greater risk of bleeding financially. So, it matters to be awakened of the reality that the time for planning as well as doing some proper actions is today. 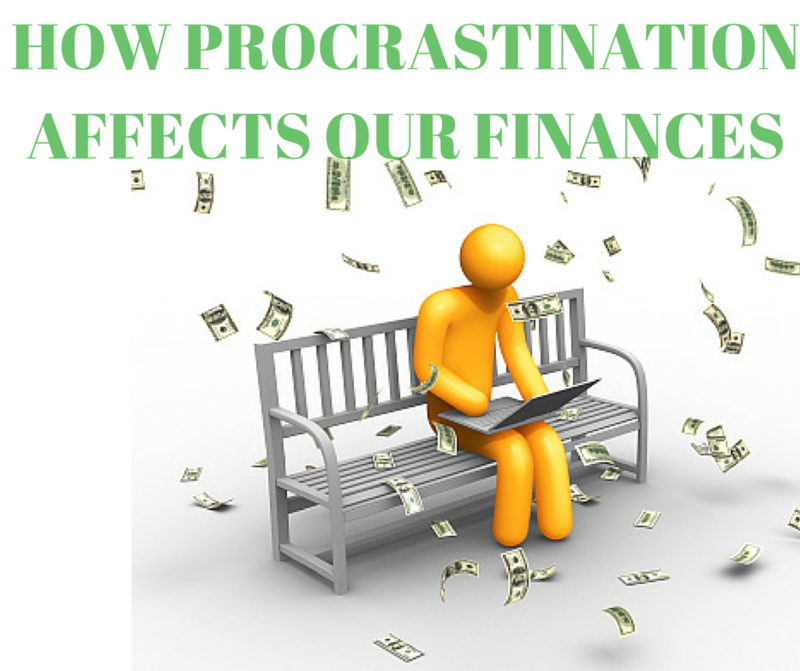 Procrastination is the crafty killer of financial security and stability. Procrastination can cost you dearly when it comes to life insurance and other personal protection insurance such as critical illness insurance and income protection insurance. This is because of the risk that picking up health conditions before you apply can have on the cost and even the availability of these types of insurance. Most people have little idea of how procrastination can affect your life insurance options. The same way here in US, the term life insurance works. The younger you are less money you need to pay for same amount of Term insurance. More you delay more price you’ll need to pay. Procrastination is one of our biggest enemies. I’m king of procrastination. My biggest crime is delaying the payment of my rent until the very last day. A couple times I had a delay in the mail that was not my fault, which caused the check to show up after the deadline–resulting in a penalty. The delay wasn’t my fault, but had I given myself even a couple days buffer, I could have withstood some of those unforeseen hiccups. Any such penalty far and away completely wiped out any pennies of interest I made by holding onto that rent for a few extra weeks. Now a days every major US banks offer bill pay, where you can set up automatic check payments. checks are delivered to the address on the date auto pay is setup.